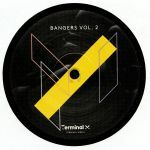 Review: There's no pussyfooting around on Terminal M's latest multi-artist extravaganza, just wall to wall slamming techno "Bangers" for dancefloors that like it heavy and high-octane. Fittingly, Joyhauser's opener, "Killer Queen", is a throbbing, trance-inspired techno slammer of the kind regularly released by the Drumcode label. Patrik Berg takes a different tack on "Galactica", wrapping icy electronics, glacial chords and intense acid lines around a kick-drum driven groove, before Teenage Mutants and Moonwalk return to the trance with a spiraling, all-action workout that sounds like it was inspired by the genre's late 1990s heyday. To round things off, Skober steals the show via the giddy breakbeats, warehouse-friendly synth stabs, wild acid lines and heavy bass of "Raving Ethos".